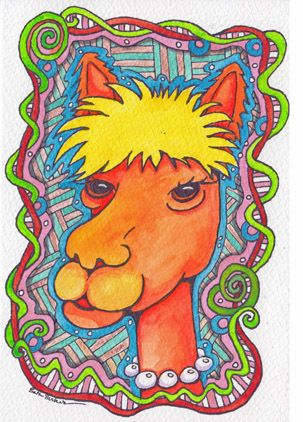 Mary Y. over at WetCanvas posted the cutest little Alpaca youngster on her WDE a couple weeks ago. I painted this from her photo. In fact, the Halloween Cat was also from her WDE. Of course it was a white cat. I’m sure Mary won’t mind her white critters becoming orange. She knows what happens at Bethville. The flamboyant American author Truman Capote is best known for his book In Cold Blood, the true story of the murder of a wealthy Kansas family. Written in a literary style, it spawned the creative nonfiction genre. Born in New Orleans in 1924 and raised by relatives in Alabama, Capote moved to New York when he was nine to live with his mother. He was a larger-than-life personality, known for his colorful attire, his lisping voice, and his outrageous statements. He died in 1984. This Orange Cat (too early) for Halloween! Hey... What is that cat up to?